I have made a 3D clock using Tim Holtz Tick Tock die. The clock has been painted with gesso, and then I added some "MetaMica - Blue steel" to add some extra colour effect to the white. I have used a vintage motive from "Pion Design - From Grandma's Attic: Tinted - Girls". The motive has been cut out and mounted on the background. The background paper is from Prima - "Fairy Belle Collection - firefly". 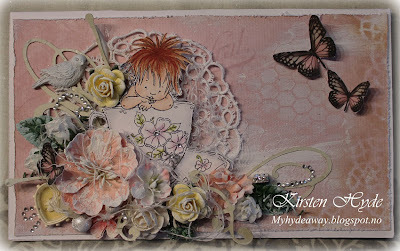 The little bird and some of the butterflies are from a Graphics 45 paper - Secret Garden Collection - Leafy treetops. Some butterflies are from anther Graphic 45 paper - Butterfly Specifics - Olde Curiosity Shoppe. The flowers are a mixture of flowers. Some of them are white Mathia flowers coloured with promarkers. 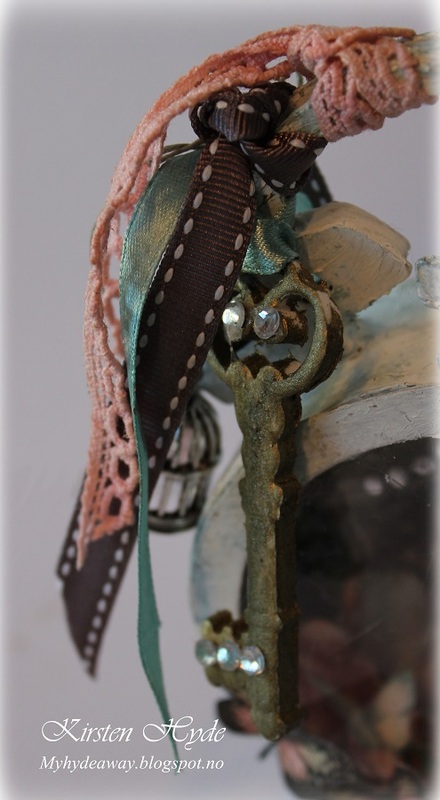 The key is made from a die cut of Craft foam, using a die from Spellbinder - Jewel Keys. The craft foam has been painted with MetaMica - Pewter and then had some strass bling glued on. The lace is an old white lace, sprayed with a mixture of dylusions sprays (mixture of squeezed orange and cherry pie). The ribbons are from Søstrene Grene. 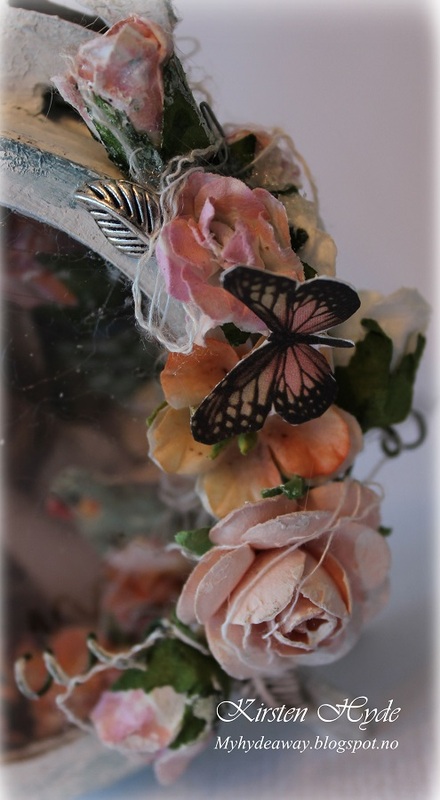 The shabby tea room - Week 164 -Spring - colours, flowers, lace and ribbon. I am holding craft classes at Hobbykunst, and in May I am going to have a class in making a mini album. During the class, we will be making the album, but not compleaty decorating it. 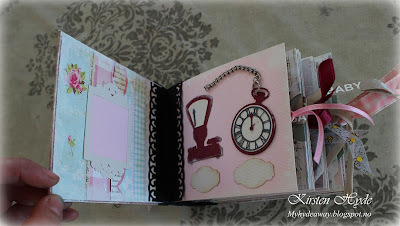 I have used papers from Prima and bazzill. The diecuts have been cut on a silhouette. 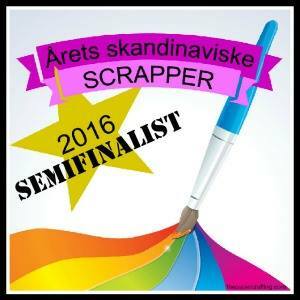 The album is currently at Hobbykunst. A while ago, I made a simple card/ name tag for a friend. 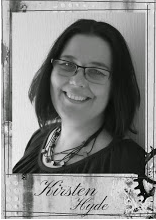 I never got around to blog this one before now. I think this is a Mo Manning image - the image has been coloured with promarkers. I have used a Martha Stewart Punch - to craft the paper lace. I have made a picture. 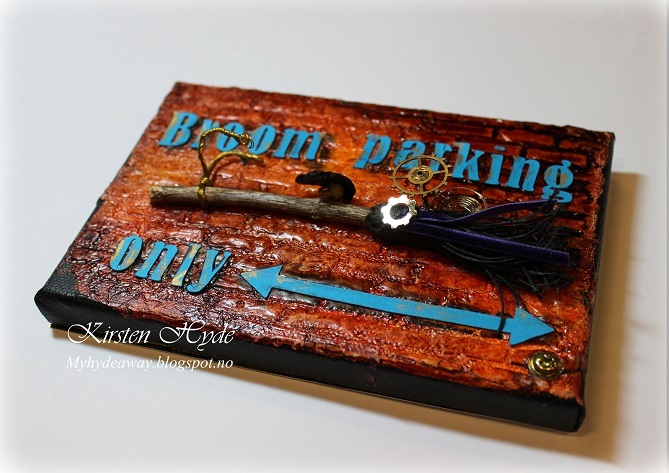 The dimensions are 20cm x 20cm, and it is mounted on a thin MDF board. 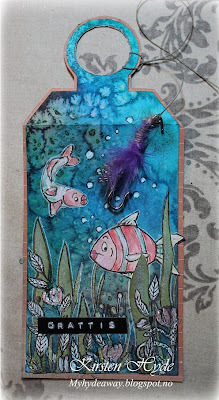 The main paper in the background is a piece of white card, that I have coloured and decorated. 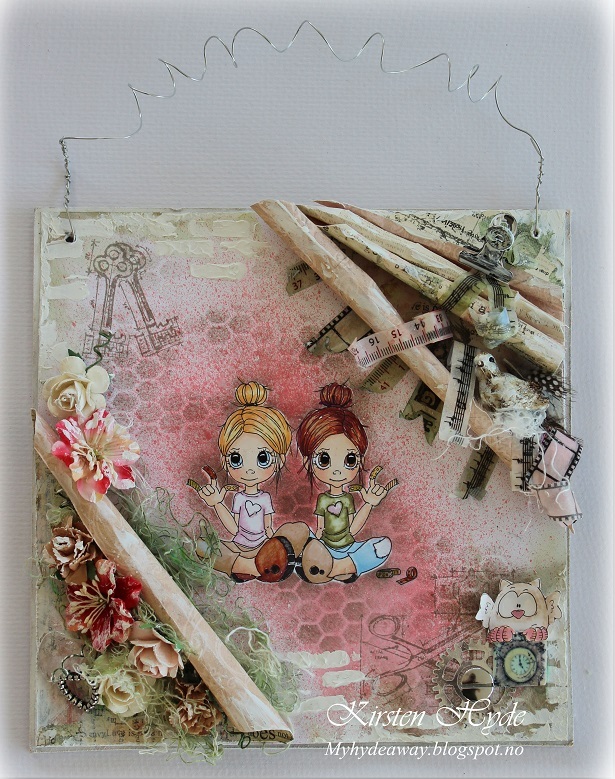 The girls are a digistamp from Saturated Canary - Washi tape kinda girl. The stamp feature one girl. I have printed it out twice. I masked the first girl mirrored the girl and printed her out again on the same paper, although a bit to the right on the page. Then I masked both the girls - sprayed the background with dylusions sprays (mixture of squeezed orange and cherry pie) and Pearl glimmer mist. Then I covered the paper with a stencil and added distress ink - pumice stone. In the top left corner and bottom right corner, I have stamped with stamps from Tim Holtz - Mini Blueprint 3. The stamps have been masked to leave the impression of them being layered. 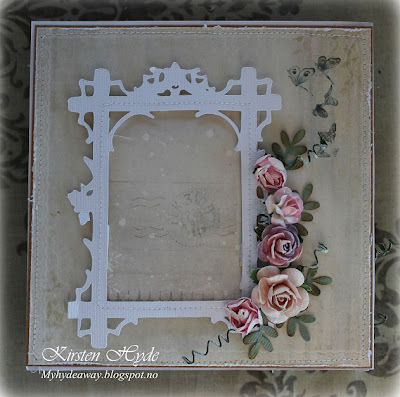 I have used gesso and a brick stencil to leave brick pattern at the edges of the picture. 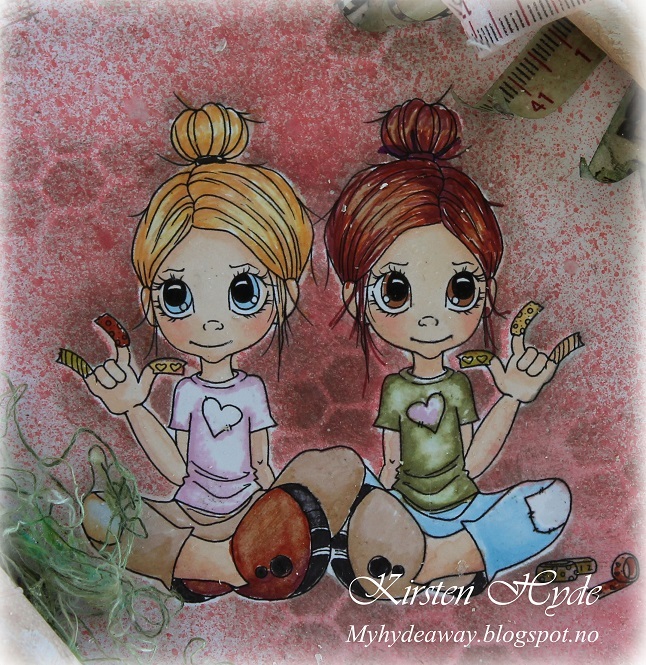 The Washi tape girls have been coloured with promarkers. The paper in the top right corner and bottom left corner, I have used I paper from Prima - Tea - Thyme Collection. I have also used several types of washi tape from Panduro. The washi tape has been coloured with alcohol ink. The bird is from a dismantled casted decoration, where I used a hammer to hit the bird of the rest of the cast. The green threads are yarn for polishing the car. I have coloured it with alcohol ink to get the green colour. 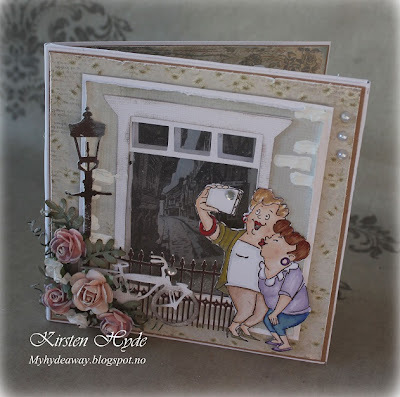 I have made a card for a girl in a mixture of styles. 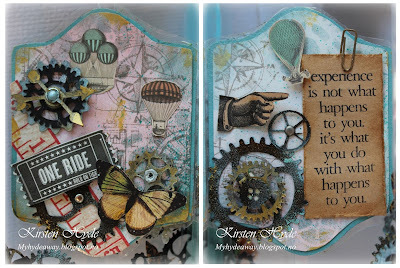 I wanted to make a sweet and rough "Tim Holtz" style card for a teenager. 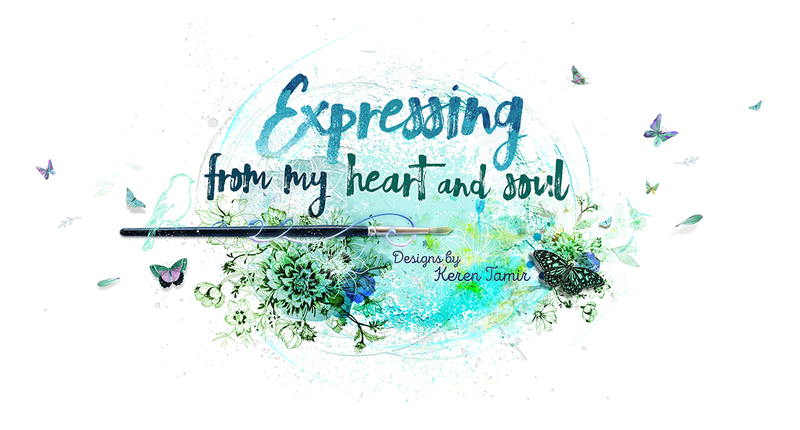 I decided to make all the background papers myself, experimenting with sprays, distress inks, stencils MetaMica, Gesso, dylusions sprays, distress embossing powder and dry embossing - just having fun :) This card is inspired by a project made by a really good artist, Karen Berniston. The card is made from a sheet of plastic, then embellished and decorated. 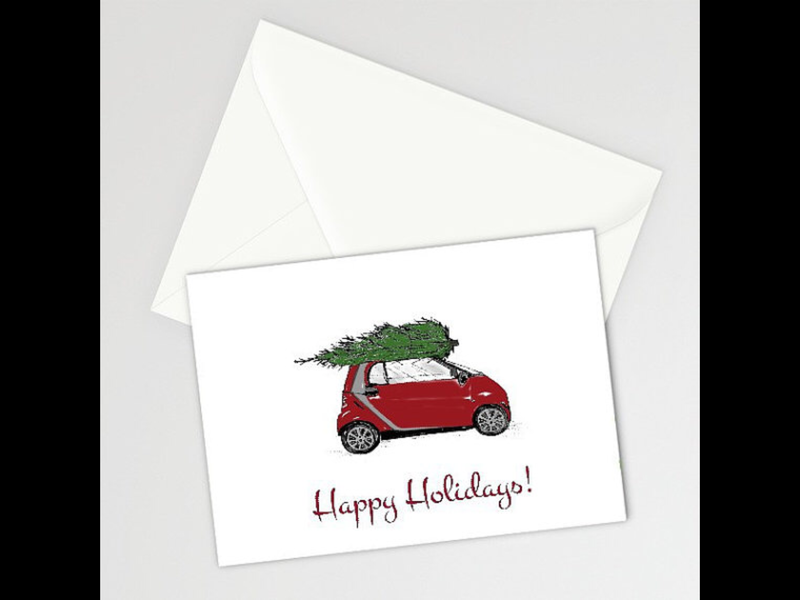 On the front and back of the card, I have used white cardstock, sprayed it with dylusions sprays and Color shine. 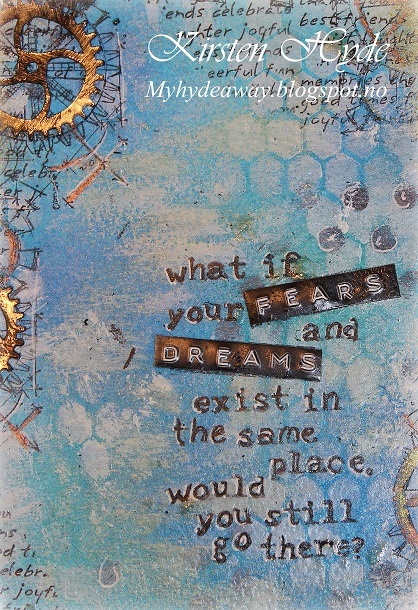 Then dry embossed it with "M-Bossabilities A4 Card Embossing Folder - Kickin' Rubber" from Spellbinders. In the end, I pained the paper black and sanded of the black paint where the paper was raised. The butterflies are cut out from a paper from "Graphic 45 - Olde Curiosity Shoppe Collection - Butterfly Specifics"
The paper on the inside is also handmade and decorated in a "Tim Holtz style". 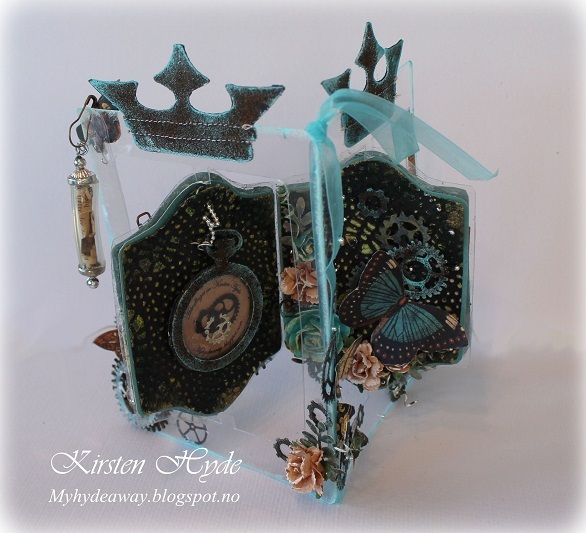 The Crowns are a modified freebie from Shery k designs. 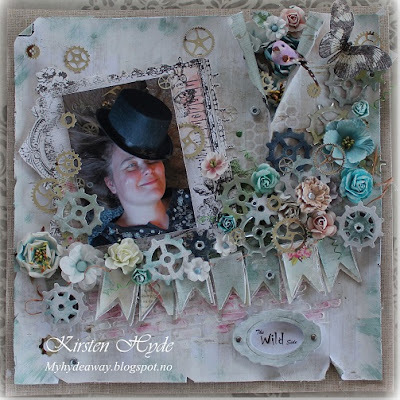 They are cut with silhouette, distressed with distress embossing powder - vintage photo and slightly coloured with a mixture of gesso and vibrant turquoise dylusions spray. The tube is a handmade tube, made from pearls and a plastic tube with wire going through it. 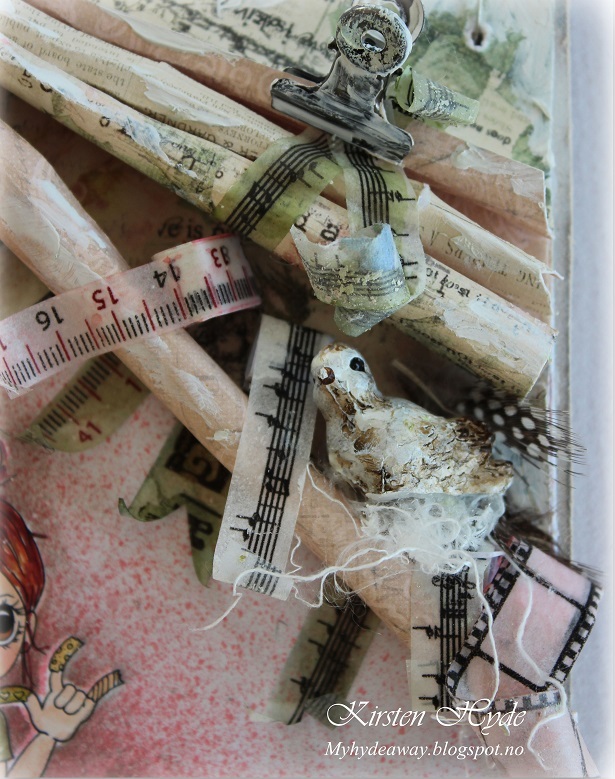 I have used a small part of a book page inside the tube, and this also hides the wire. 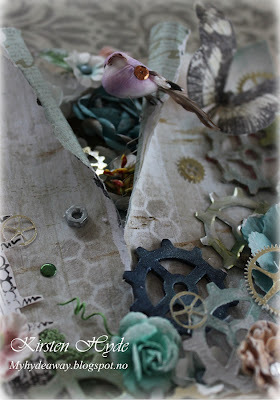 The gears are different freebies from, cut out with a silhouette, distressed distressing embossing powder and/ or painted with gesso and MetaMica. 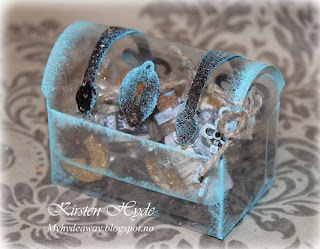 I often find it difficult to wrap a money gift in an interesting way, instead of adding it in an card. I got a small plastic treasure chest from Hobbykunst, and my task was to make something out of it. 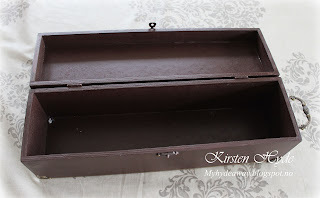 I made the chest as a gift wrap for a money gift. The coins are homemade. 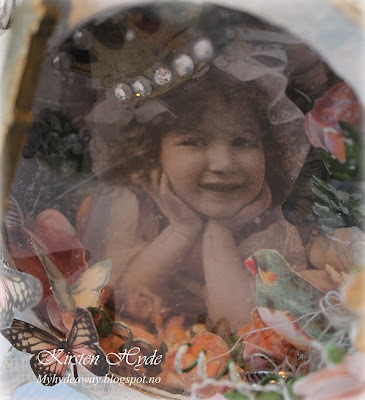 I have made them by cutting a circle from cardboard, adding Distress Embossing Powder (Vintage Photo). 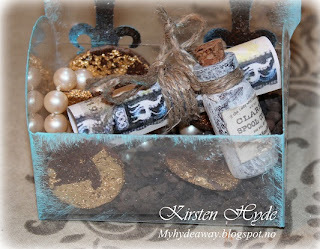 I have then added sticky embossing powder, heated them and added gold metal foil. I have sprayed the coins with clear lacquer. 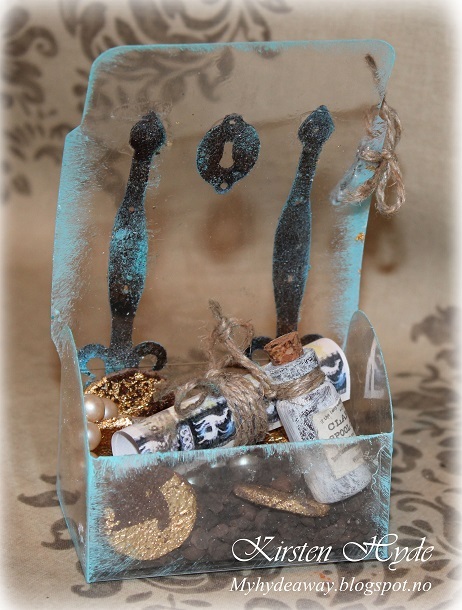 The small bottle has had some alcohol ink inside and then painted with gesso on the outside. The elements on the outside are diecuts. I have added distress embossing powder (vintage photo), painted with a mixture of gesso and dylusions spray and added some gold metal foil. This time, I have made a British shaker card. The background papers are from "Grandma`s School Book - 6 Tum - Blue Wings". 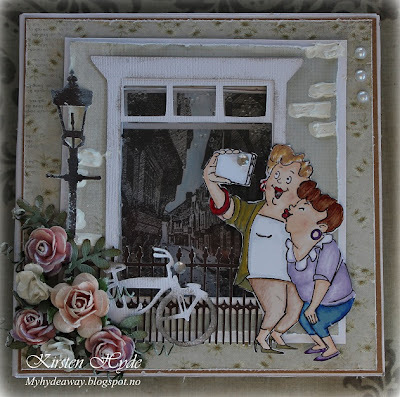 The two ladies are part of a rubber stamp from Art Impression "Picture Perfect". They are coloured with promarkers. 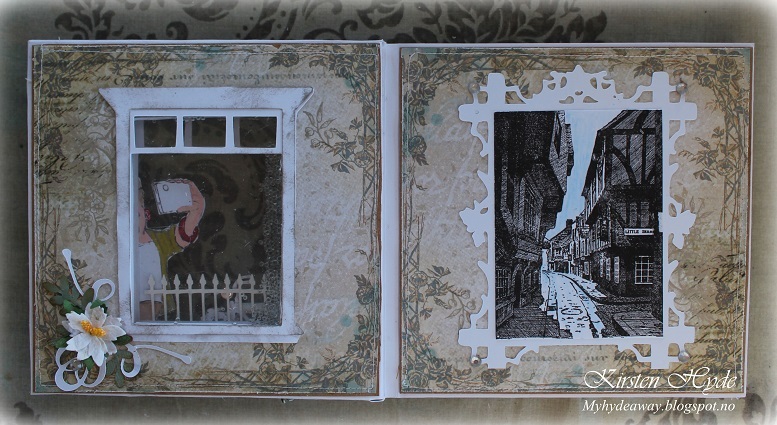 I have used a photo stamp of The Shambles in York behind the window. The fence is a homemade cut file, made from a photo I took of a fence in Brighton. The lamp post is a homemade cut file made from a photo I took in Sweden. The bike is also a homemade cutting file made from a photo of a bike. 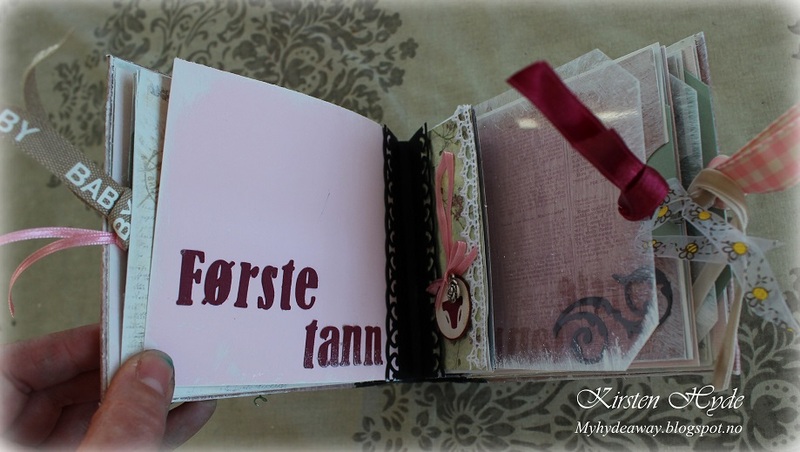 The papers inside are from Prima - Botanical collection. I have left space for a message on the back of the card. 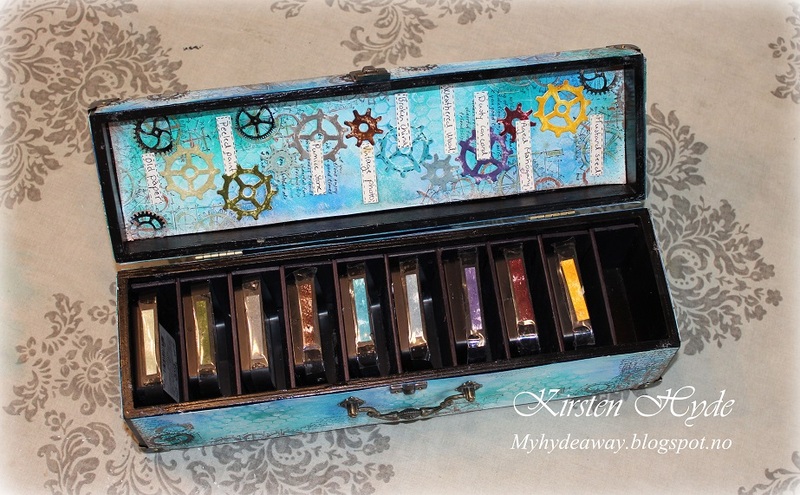 I have altered a box, and made a distress ink storage out of it. The box was painted black. Then I used aquarelle paper for the panels, sprayed with dylusions spray. I have made individual shelves tor the distress ink pads inside the box. The shelves have been made from black chipboard. I have also marked each pad with the right colour on the side. This box has room for 10 ink pads. 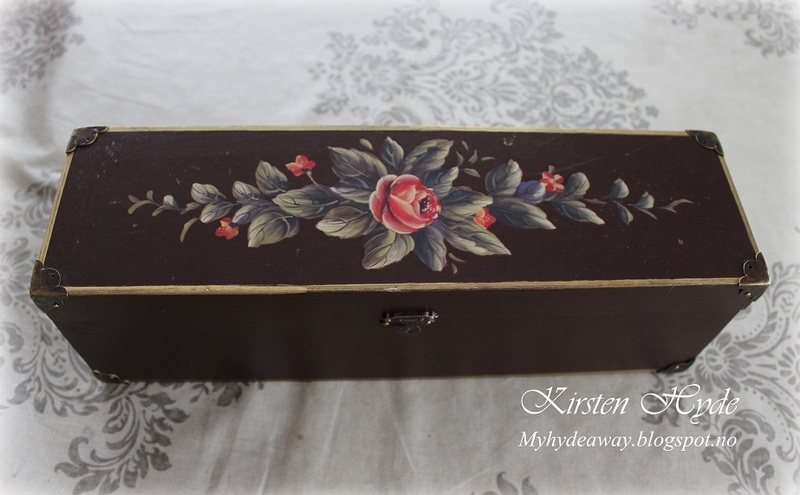 This is the box, and I found it at a flea Market last weekend. I think it originally was a box for a wine bottle. The outside panels were sprayed with dylusions spray. 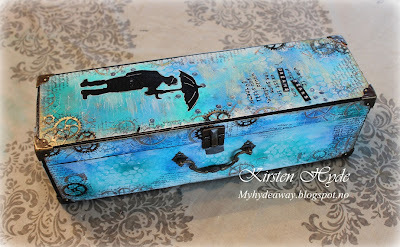 Then I added pattern using gesso and handmade stencils. The text is from Tim Holtz - Stuff 2 say. 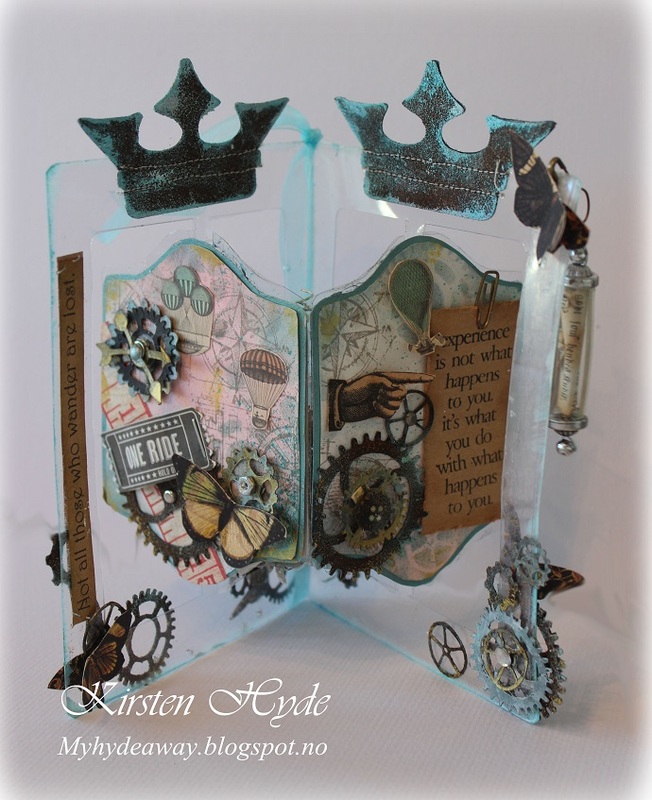 The gears are also from Tim Holtz - Mini Blueprint 3. 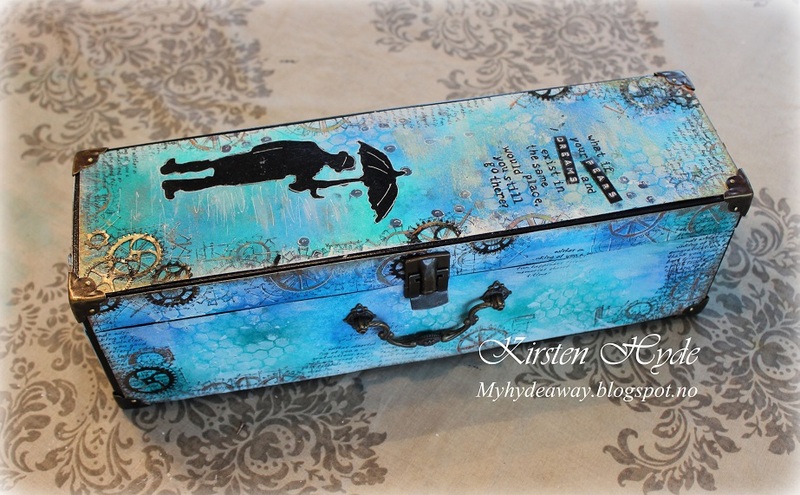 The man with the umbrella is a dies from Tim Holtz - Umbrella man. I have cut the man in craft foam and stamped with it. 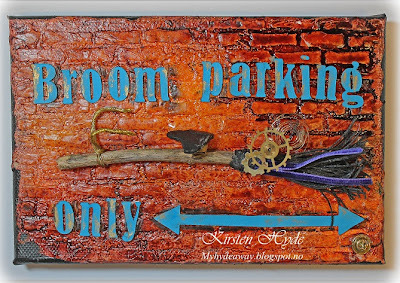 I have used acrylic paint to stamp with. The gears are cut from gold paper with a silhouette. 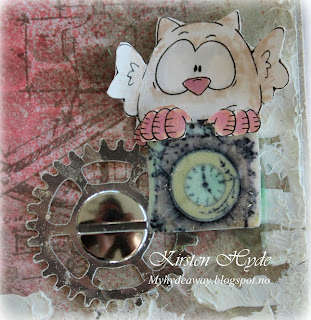 I have also cut some gears with a Gear dies from Tim Holtz, coloured them with my distress inks and named them. Because the dylusions sprays are water soluble - it will give colour quite easily Therefore, I have spray coated the finished box with clear lacquer. 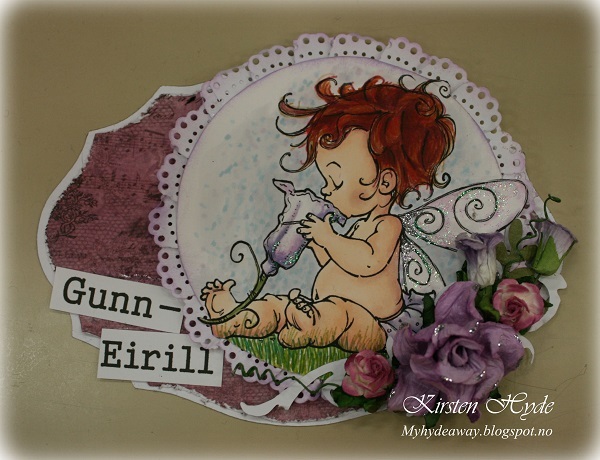 I have made a baby card with a spring theme. 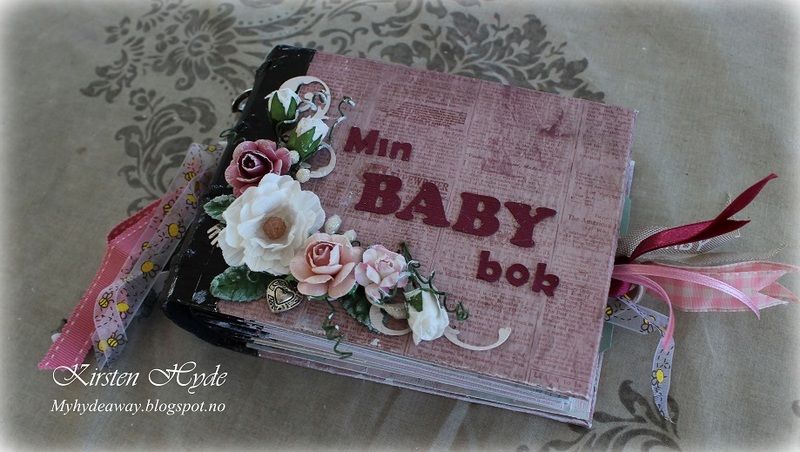 The paper is from "Kort og Godt - Blomsterglede - Roser". 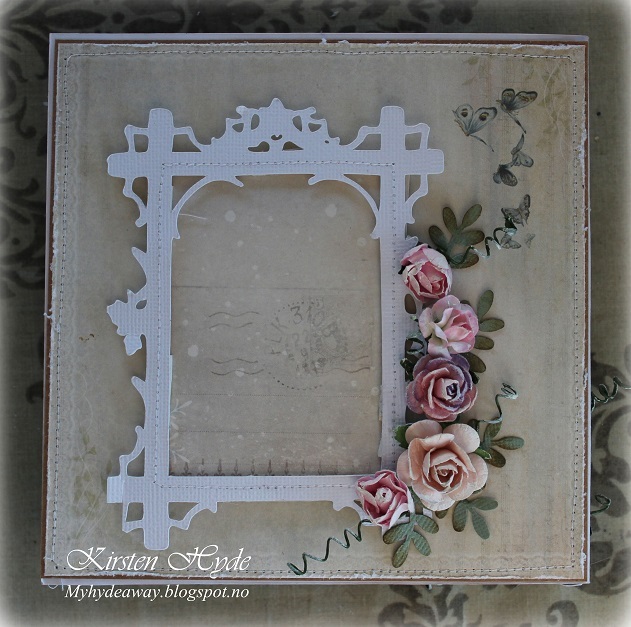 The background has been painted with Gesso, using a homemade stencil. I have also coloured the background with distress ink - using a paper doily as a stencil. I have added a tatting doily behind the baby. The stamp is a digital stamp from Mo Manning - "Teacup Fairy". 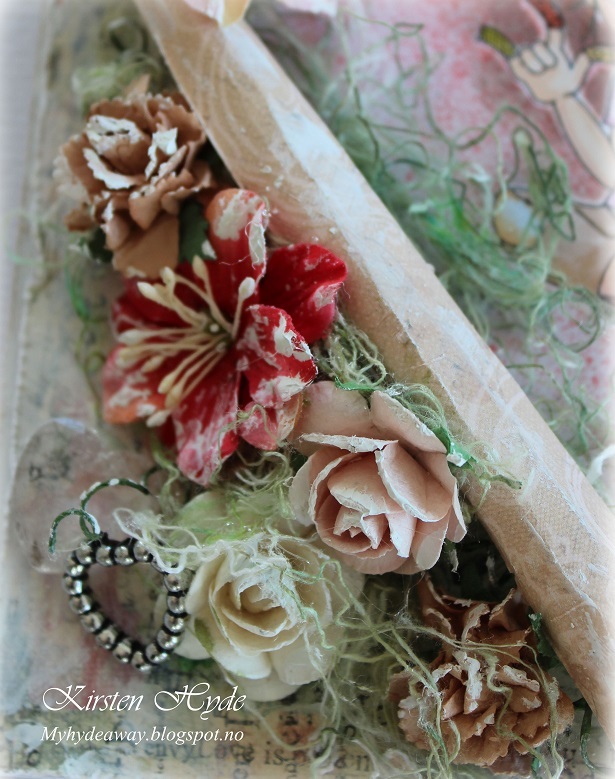 The flowers are from different manufactures - I have just had a dive in my flower draw. I have added Gesso to the flowers to give them a shabby look. 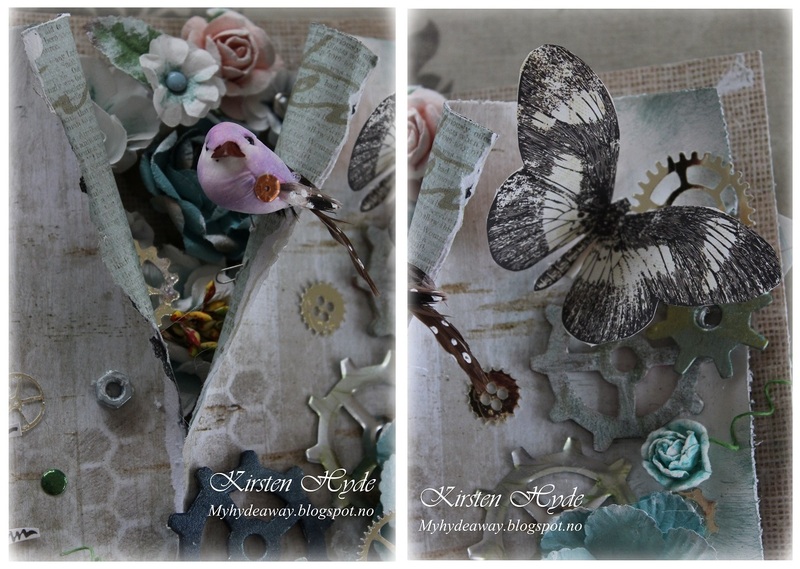 The butterflies are cut out from the background paper and added to make a 3D effect. I have made a bottle tag in an Art Journal - Collage style. 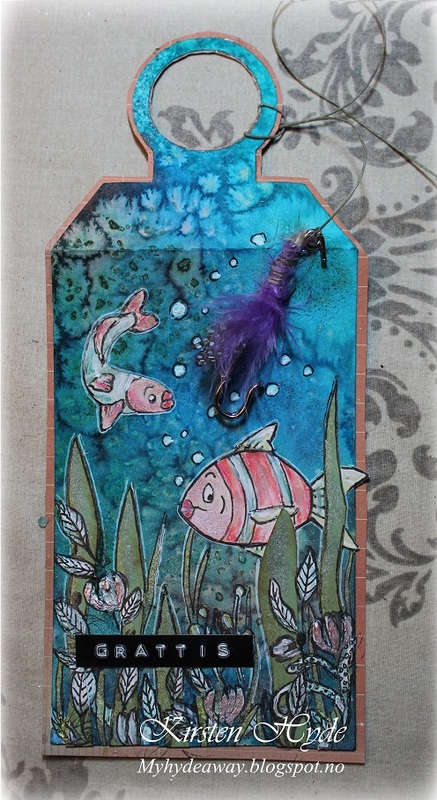 The tag was cut in aquarelle paper and was sprayed with dylusions sprays and color shine. Then I sprayed it with water and added salt. I left the tag to dry. Then I drew the fishes and cut them out of different left over papers. The sea weeds are cut from green bazzill and painted with Metal Mica. The white leaves where stamped on, then painted with gesso and the black lines were drawn back on leaves. Last weekend I took some steam punk photos with some friends. I wanted to challenge myself and make a LO out of one of my photos. I really don't blog a lot of LOs, and I have often found it difficult to make a LO with lots of layers and making my own background - so I made the decision to have a go. As a background, I have used Prima paper - Orchestra Lyric, box office lyric and Prelude Lyric. Inside the split at the top of the page and on the banners, I have used Prima - Botanical - My Darling. I have also worked on the background to get some texture. I have used a handmade stencil and gesso to make the brick pattern. The bricks have been coloured with distress ink. 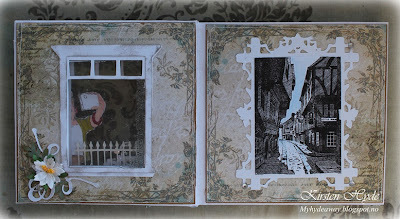 The edges of the page has been coloured with gesso and Stewart Gill Meta Mica Verde Gris. Some of the flowers are made from Mathia flowers, some are from Prima and some are from Penny Lane. 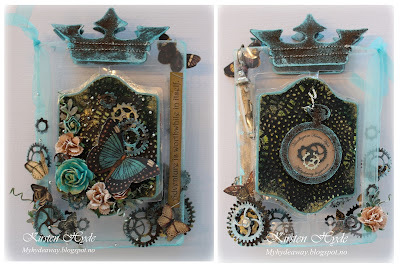 Some of the gears are cut with gear dies by Tim Holtz. I have used old soda cans and cardboard. 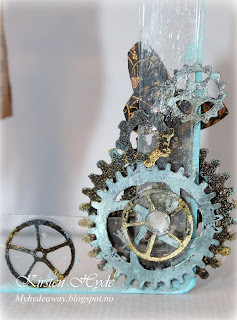 The gears have been painted with gesso, Meta Mica and Alcohol ink. Some of the gears have been cut in gold paper using a silhouette. 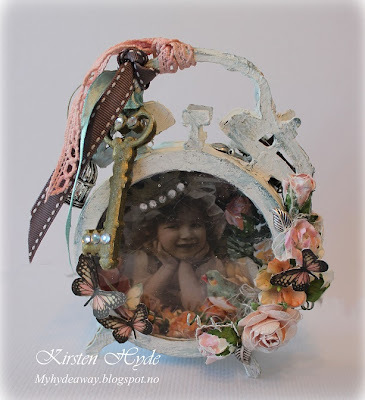 The chicken wire pattern has been made with a homemade stencil and distress ink. 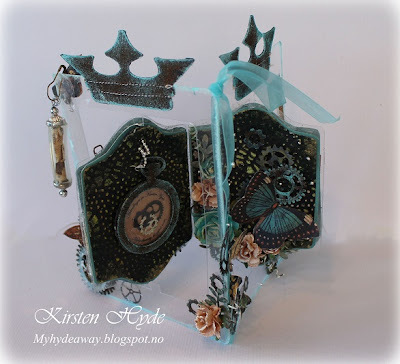 The tag frame - is a dies from Tim Holtz. The tag has been cut in cardboard, painted green and then I have added a thin layer of gesso. 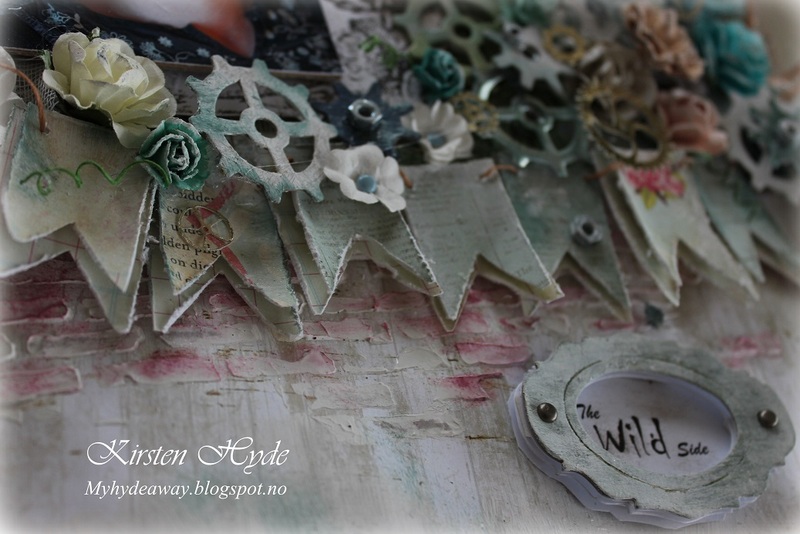 The text - The wild side - is a digital stamp, that I made. I am giving it as a freebie. 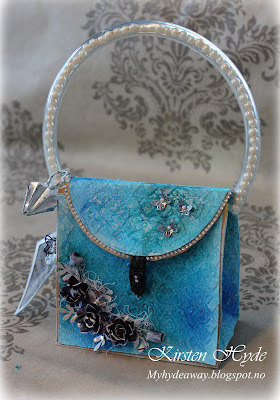 As a challenge from Hobbykunst, I got a paper bag to create something from. I made a purse out of the paper bag. The background paper is white bazzill. I have uses Yes paste and a diamond stencil (my own design) to create the pattern. Then I have used dylusions spray to add colour. 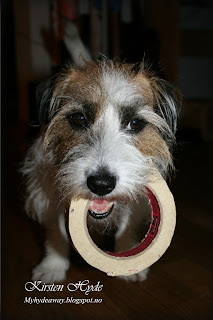 The handle is made from a plastic tube from Biltema. I have added an old plastic bead necklace inside the plastic tube. The flowers are made from an old can. The flowers are punched out using a flower punch, colours with alcohol ink, shaped and mounted together as flowers. 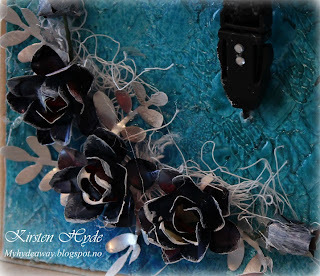 I have also added gesso to the edges of the roses. 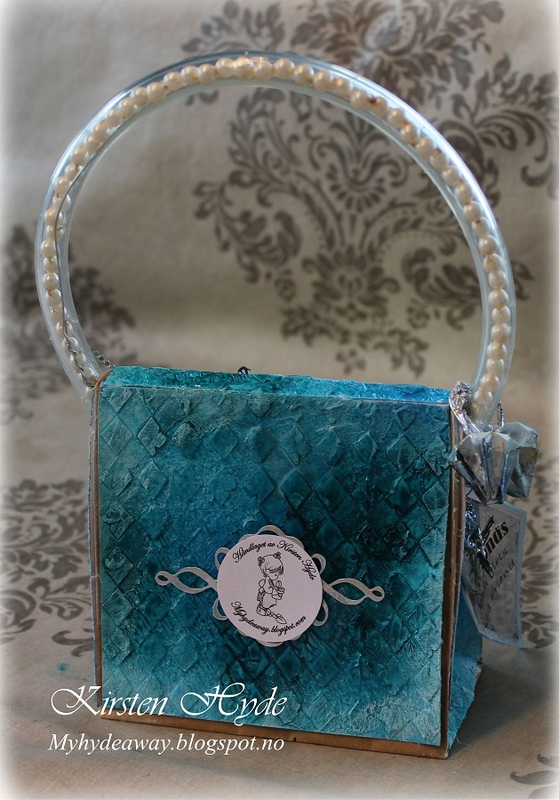 I have also added some bling to the side of the purse. 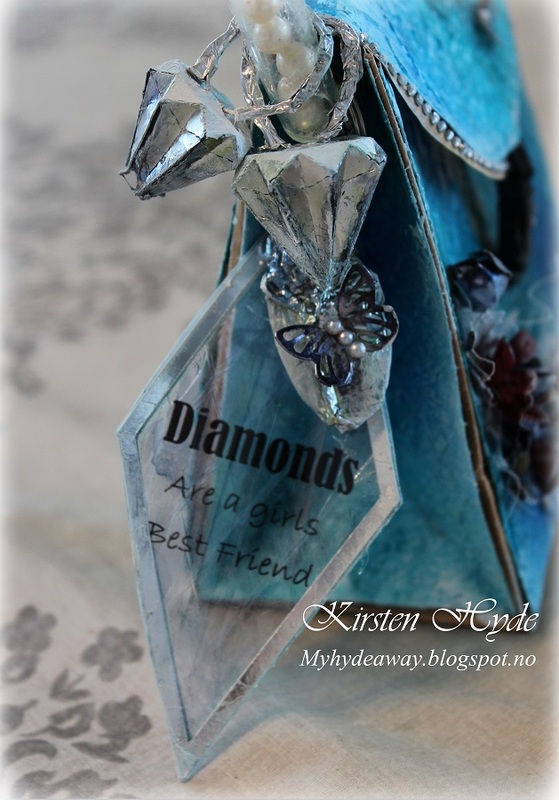 I have printed the text "Diamonds are a girl’s best friend" on a sheet of overhead paper. Then I have added some thick acetate to the back of the diamond tag. The acetate was embossed in a diamond pattern and coloured using alcohol ink. The acetate tag was then edged with silver paper. 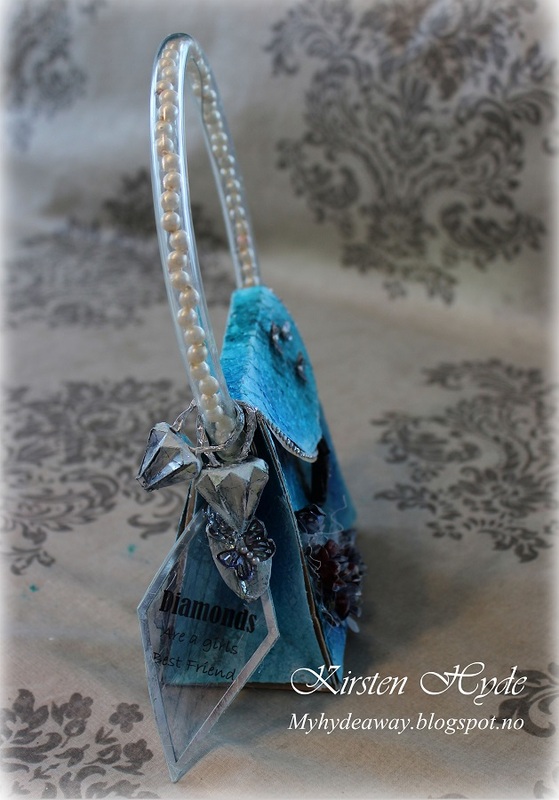 The diamond rings are made from silver paper. I have also added a handmade charm. This is an oval large bead, with a rose charm and wire, covered with metal tape and shaped. I have added alcohol ink and gesso to the charm. 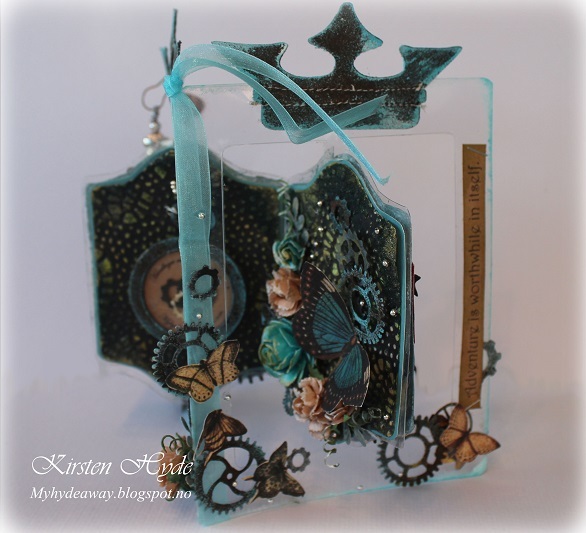 The butterfly is a metal butterfly, coloured with alcohol ink and with half pearls. The back of the bag has a metal swirl and my name. I have tried Yes paste on a small canvas on a wooden frame. The paste was applied over the canvas, then I put I brick stencil on the top of the canvas and added a thin layer of more Yes paste. Then I left the paste to dry. I then spray painted the canvas with dylusions spray. The edges of the canvas have been painted black. The letters has been cut from bazzill, using a silhouette. The broom has been made with a small stick with black string. I have added golden silver wire as handlebars. The seat has been made of card board, painted black and fixed with metal wire (and super glue) as suspension. I also added some metal gears on the broom. I have also decorated the inside the wooden frame of the canvas. 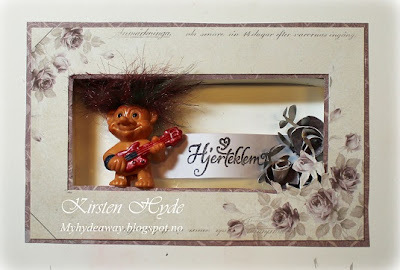 I made this in a totally different style, with paper from Pion, handmade roses and a small troll.